Your C64 plays back MP3 files in CD quality! MP3@64 by individual Computers is an expansion for the meanwhile discontinued MMC64. It also fits onto the new IDE64 V4.1. 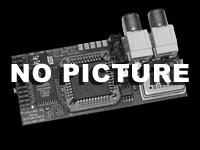 The MP3 module uses a DSP for MP3 decoding and a separate DA converter with 20 bits resolution for best audio quality. The output comes either through two Cinch connectors, or through a CD audio connector that is also used by CD ROM or DVD ROM units. Even with output being possible on active speakers, we recommend using good HiFi equipment, so the excellent audio quality can actually be heard. Q: Does the MP3@64 also work with an MMC Replay? A: The MP3@64 mechanically does not exactly match the clock port of an MMC Replay. Consequently, it is only barely possible and definitely not recommendable because you would risk a short circuit! 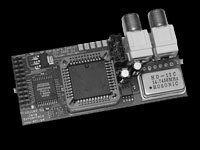 Only the no longer available MMC64 model provides a proper use of the MP3@64, as well as the new IDE64 V4.1. MP3 Plugin V0.70 by Oliver Achten - plays MP3 files with the MP3@64 module. Works on both, PAL and NTSC. The MP3 Plugin can playback whole directories as playlists (continue/shuffle). MP3 plugin v0.3 by Soci - MP3 player plugin for IDE64+MP3@64.